Spectacular ocean and beach views from this unique beach house. You can see the amazing views from all three levels - with separate entrances for your convenience! And the beach is only a short stroll away! Nico's Beach House is a desirable Langs Cove holiday home for anyone from couples on a romantic getaway, to the extended family or corporates wishing to retreat! Rates listed are for the whole house. The interior design has a contemporary, casual and uncluttered feel and the astounding views are a real highlight! The top floor apartment has 2 bedrooms, 1 bathroom, open plan kitchen/dining/lounge and large outdoor patio. This level sleeps 5 people on 1 King bed, 2 King Singles and 1 Single trundle bed. The middle floor apartment has 2 Bedrooms, Bathroom (with bath), and an additional open plan kitchen/dining/lounge for your convenience, and a large outdoor patio. This level sleeps 5 people on 1 King bed, 1 Queen bed and 1 Sofa bed in lounge. The ground floor studio includes a kitchenette, ensuite bathroom with shower and can sleep 4 people, in 2 King Single and 2 Single trundle beds. There is Sky Television (Sport) in apartments and Wifi broadband across all levels at this amazing holiday accommodation. There are Gas Barbecues on both outdoor patio areas plus garaging for 3 cars. Popular activities in the area include swimming, surfing, walking, kayaking, boating and golfing (there are two Sand-based-all-weather courses within a 15 minute drive). Close to great fishing and diving of Northland! 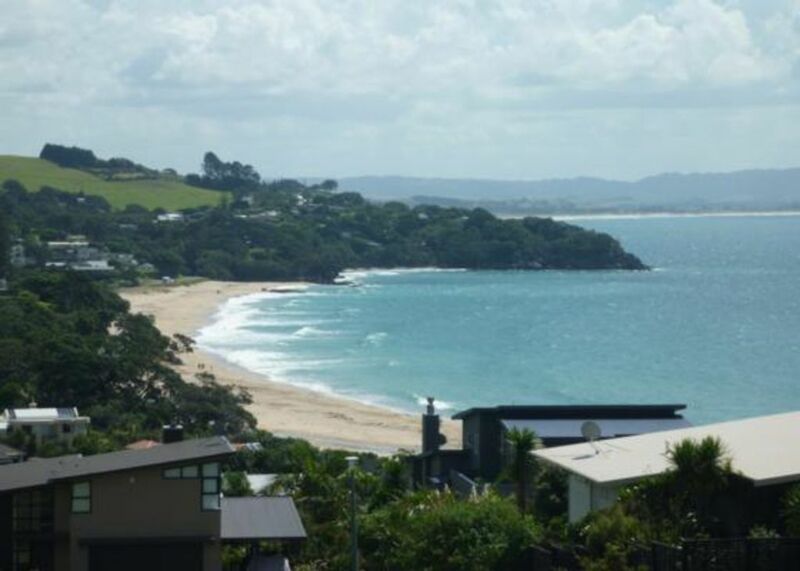 Restaurants, coffee shops and takeaway meals are within a very easy drive of this fantastic beach pad. Plus there are tennis courts across the way! Remember your rackets, shoes and balls. Langs Beach is just 90 minutes north of Auckland and situated between Mangawhai Heads and Waipu Cove (45min to Whangarei). Nico's Beach House in Langs Beach, is the perfect place to visit, re-charge your batteries, and create wonderful memories. "Will not rent to groups of teenagers"
"Cleaning fee can be waived by owners on prior agreement." Great views, house stays cools in hot sun. Roger/property manager was very helpful with any issues and addressed them straight away. The liner on our mattress looked like it hadn't been changed in a good long while, as the plastic surface was disintegrating and all over the mattress underneath. Also possible there may have been some bed bugs, as a few of us had bites all in a row--definitely more at-home bites than out-and-about bites. Otherwise a nice spacious place close to gorgeous beaches. Please refrain from making extremely damaging comments like that without proof ! Great house for our big family. The housing manager was very accommodating and helpful. The beach and shops were close by, making it accessible. For future improvements; I would recommend bigger bins for the top and middle level. We could only locate two tea towels to accomodate 12 adults, 2 kids and a small toddler. We also only had one towel each. Additional linen would have been appreciated. I highly recommend this place. Thank you for having us. Lovely place to stay at. Lovely place to stay at. Awesome views and enough space for a big family or group of friends. The property has a fantastic location, excellent views. Such a beautiful location and house. Such a beautiful location and house. Enough space for everyone to do their own things and enough space to all hang out in one room. Beautiful views and amazing facilities. Definitely want to stay again! We had a great stay, very nice place with amazing view. We had a great stay, very nice place with amazing view. Bookabach site advertises kayaks and life jackets available, but were not there. Also advertises Sky tv which did not work. Tried to contact the house manager but did not answer or phone back.